What are the differences between similarly-sized Kodiak Tents? Kodiak has several canvas tents with the same floor size, but considerably different prices. For the most part, these tents will be made with similar-quality components, but have some differences in layout and structure. Here are the most commonly questioned models below. 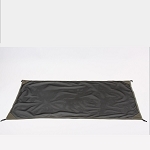 The 6010 is referred to as the deluxe model of the 10 x 10 flex-bow tents. The 6010 features 2 doors and 2 windows on the front and back of the tent. The 6051 has 1 door and 1 window on the front and back. The 6010 will have an additional gear loft included. The 6051 does not. Lastly, the pole and storage bags for the 6010 have a synch and tie design for easier storage and transportation. The 6051 has only a basic storage bag with not synch. Differences between these two 10 x 14 tents essentially mirror the differences between the 6010 and 6051. The 6014, in this case, is the deluxe model, which includes the 2 doors and 2 windows in the front and back of the tent, the gear loft, and the synch and tie storage bags. The 6044 features the 1 door and 1 window in the front and back, no gear loft, and a regular storage bag with no synch and tie feature. These models are the easiest to differentiate of Kodak's similar tent models. These cabin tents feature a 12 x 9 floor plan. The 6133 features a deluxe awning, which means the awing has a pole and frame structure through it, and is much larger and sturdier than the flap awning on the 6121. This awning on the 6133 can also accept a wall or screen enclosure - sold separately - and the 6121 cannot. This awning is the only difference between these two tents. For further information view http://www.kodiakflexbowtents.com/View YouTube Video "Kodiak Canvas Flex Bow Tents"